Friday was grandparents day at Perry's school. I remember how fun it was as a kid to have my grandparents come to school and celebrate the day with me, and I knew Perry would be so excited to see his Granna and Granddaddy walk through the door. So I let him wear his "Best Day Ever" shirt. 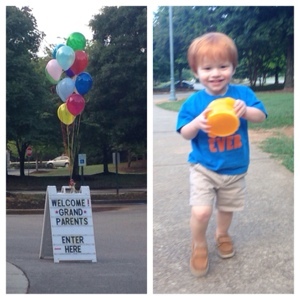 When I dropped him off at Mayfair, they already had balloons outside with a "Welcome Grandparents" sign. 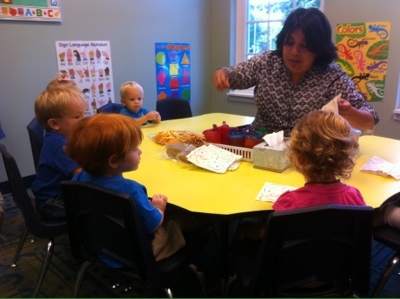 Granna said they had a good time at Grandparents day and that Perry does really well in his little class. That he and his classmates obey Mrs. Patty and follow instructions really well. Kate's class was also having Grandparents Day at the same time so Ann and Gary split up and traded off so they could spent time with both. 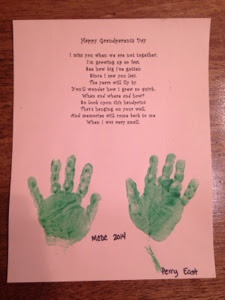 The kiddos also did these cute little hand print poems for their grandparents. Perry got a real treat when he realized he was going to leave with Granna and Kate for the rest of the day. Granna took Perry and Kate to go run some errands which included Southerland Station, where P was just in little boy heaven with all the trains. 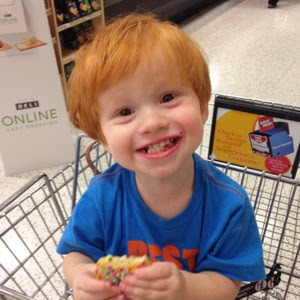 After I picked P up that evening we had to make a quick run by publix for some groceries for Saturday's festivities which meant a cookie for this little cookie monster. Because who could say no to this face? I think he really did have the Best Day Ever. 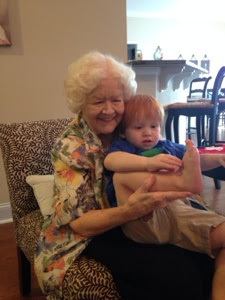 In addition to Grandparents Day, Friday was my grandmother's birthday. She said she wanted a playdate with Perry for her birthday, which we happily made happen. Saturday morning we went to pick her up and bring her back to our house to play with Perry and his toys. They had fun playing blocks, xylaphone and coloring. Then we had pizza for lunch followed by birthday cupcakes. 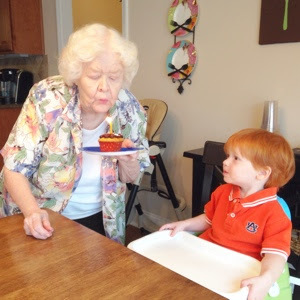 Perry tried to help grandma blow out her candle...from a safe distance because well...hot. 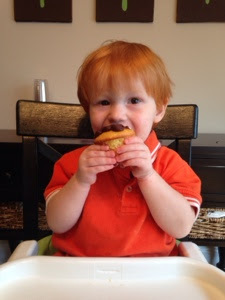 Perry was also happy to celebrate grandma by helping eat cupcakes. He had been looking at them and saying "cupcake" all morning. He was so excited when he was finally handed one and given permission to dig in. He ate almost the whole thing. After eating a piece of pizza, carton of yogurt, cheese, and strawberries. I guess there is always room for some dessert. I wish we had gotten to spend time with all of our grandparents this weekend. Hopefully we will get to see the others really soon. We are so blessed to live so close to them that we can see them often and have them be play such important roles in our lives.